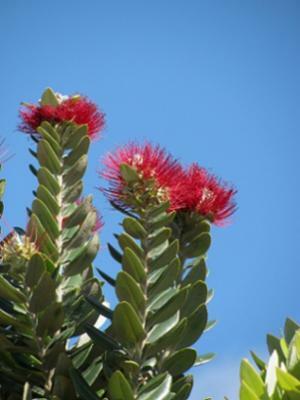 New Zealand Christmas tree is native to New Zealand and Australia and is invasive in Japan, Spain, England, Ireland and South Africa. The species was introduced to South Africa for ornamental purposes and for hedge planting in coastal area of the Western Cape. It has been recorded in Western Cape at St Helena, Pringle Bay and Betty’s Bay. In South Africa this species is invading hygrophilous fynbos (fynbos on moist peaty soils) at Betty’s Bay, Gordon’s Bay, Kleinmond and on the Cape Peninsula. Metrosideros excelsa spreads mainly by seeds. There are no registered herbicides for this species in South Africa. It is currently controlled by cutting. Large plants are not easily eradicated because they coppice when cut. It is therefore advisable to control the plant at a young stage of growth. Report sightings of these plants to the Invasive Species Programme at SANBI. We will need to know its locality (the exact locality, supply any landmarks or GPS information if possible). Invasive species in South Africa. Metrosideros excelsa. 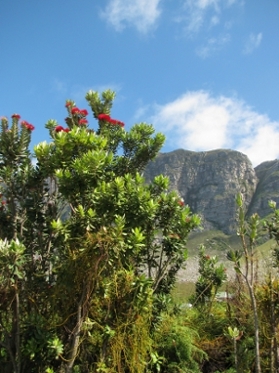 Available online at: http://invasive.org.za/flora-listed/metrosideros-excelsa.html. Plant diary. Garden of Australia. Metrosideros excelsa. Available online at: http://www.abc.net.au/garden/stories/5788278.htm.